This spicy bbq chicken marinade will give you the most tender and juicy chicken on the grill, and you can make it as spicy as you want it. Let the author of “The Spicy Food Lovers’ Cookbook” show you how to spice it up! I’ve been really digging grilled chicken lately. It’s grilling season and I’m cooking up practically everything on the grill, but we can’t eat ribs and burgers all the time. You need to mix it up a bit, and a nicely grilled piece of chicken is TOPS. Usually. Sometimes chicken can be a bit boring. It can come out somewhat dry on the grill, but not so when we’re treating it the right way. I’m talking about marinating. Marinating your chicken before grilling it up is a smart way to ensure a juicy, tender and flavorful meal. 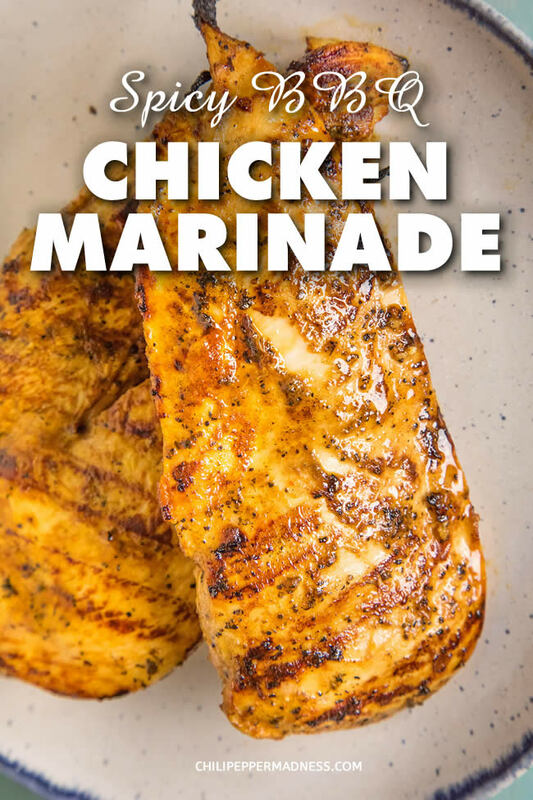 There are many options for marinating, but I have a great spicy bbq chicken marinade that will REALLY spice it up for you. This is my favorite way to marinate chicken and it has never failed me. And! Its is nice and spicy. Let’s talk about that, shall we? You guys all know me by now. When I’m talking “spicy”, I mean SPICY! However, you don’t have to go as crazy as I do with the hot stuff. This spicy bbq chicken marinade is super adaptable, and you’re free to adjust it to a heat and spice level that you personally prefer. The real spice and heat comes from the choices of seasonings, as well as the inclusion of a fiery habanero hot sauce, which is one of my favorites. 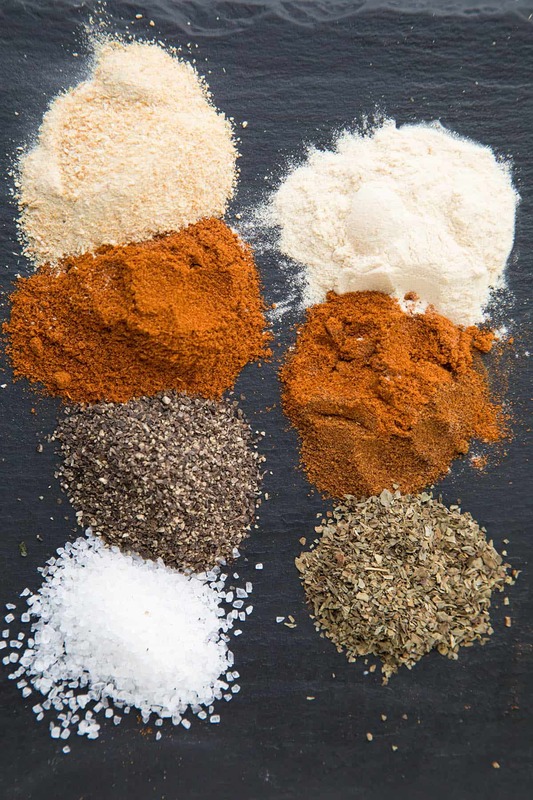 Here is the seasoning blend. The spices include basil, paprika, onion, garlic, salt and pepper and, the real heat factor, ghost pepper powder. Oh baby! If ghost peppers are too hot for you, you can omit it. Try using cayenne powder as an alternative. You’ll get some good heat with cayenne chili powder, but it won’t be quite so spicy-crazy. If you’re looking for a very low heat version, go with extra paprika. However! If you’d like to go even HOTTER, either include more of the ghost pepper powder, or go with a superhot chili powder. I LOVE my batch of homemade 7-Pot Chili Powder. I use my dehydrator to dry chilies from my garden and grind into my own powders for these sorts of recipes. See – How to Dehydrate Chili Peppers and Make Homemade Chili Powders and Spice Blends. 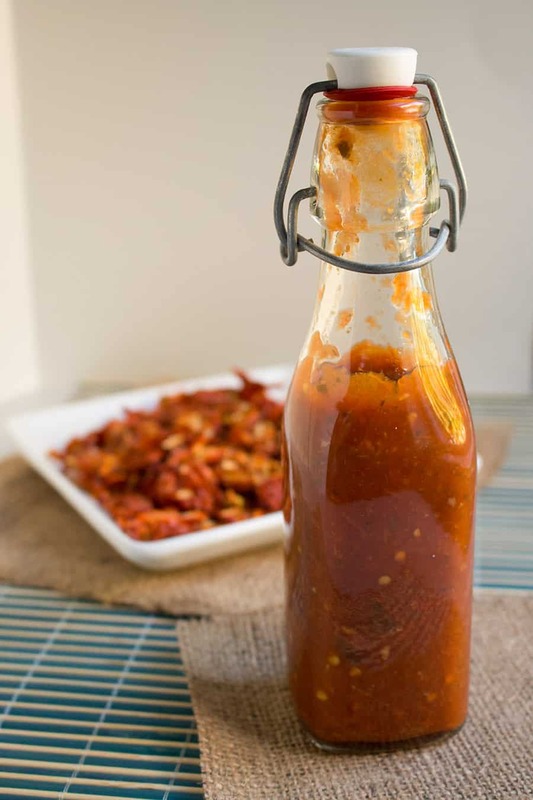 The recipe for this is here – Homemade Cilantro-Habanero Hot Sauce Recipe. There are MANY habanero hot sauces on the market today, so use your favorite, as long as it has a bit of a kick to it that you enjoy. Go for it! The marinade consists of olive oil, vinegar, Worcestershire sauce and habanero hot sauce, along with the dried seasonings that are whisked together. You can easily adjust the amounts of liquids and spices used to achieve your own desired heat level and consistency. I tend to like a bit more oil, as I find that translates to juicier chicken when cooking. It’s just so good. I love a good spicy chicken marinade. A MUST for spicy chicken! You can also squeeze in a bit of lemon juice or lime juice if you’d like a pop of citrus. Some other flavorful additions include brown sugar (for a touch of sweetness), soy sauce, and/or balsamic vinegar. Here comes the hard part, my friends. Add everything to a medium bowl and whisk! That’s it! Easy, right? Look at all those spices. This is going to make some awesome chicken right here, let me tell you. Making a marinade like this is not difficult at all. When the marinade is ready, just add your chicken to the marinade and cover it. Like so. This works for bone-in or boneless chicken. Cover it and refrigerate it for a good 8 hours. You’ll get even MORE flavor if you let the chicken marinate overnight. It gives the marinade more time to permeate the chicken. You can use this marinade for any cut of chicken, with or without the bone. I tend to use this for chicken breasts, though it’s great for chicken thighs, legs and wings. When you’re ready to prepare your chicken, just remove the chicken. Discard the marinade and cook them per your recipe or favorite cooking method. The marinade should not be saved. That’s it, my friends! Let me know how this turns out for you! I hope you enjoy the marinade. Why Should I Use a Chicken Marinade? 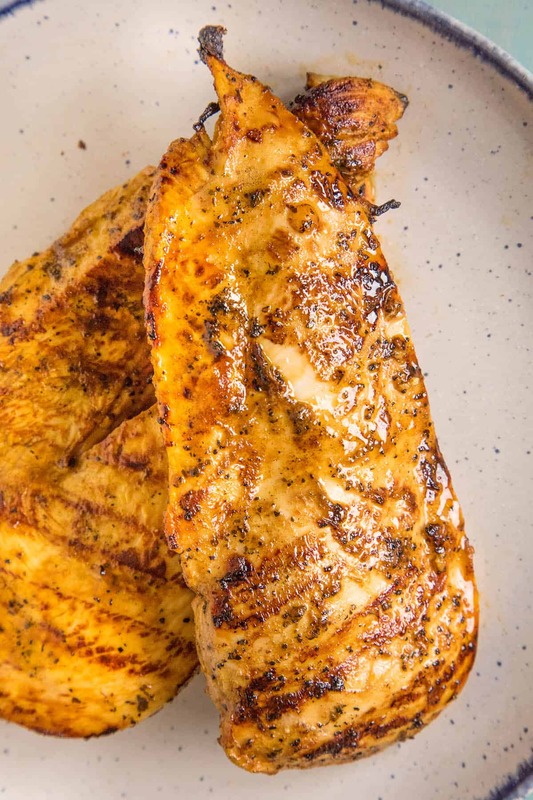 There are many smart reasons for using a good chicken marinade, especially a nice and spicy chicken marinade for my spicy food loving friends. The marinade is essentially a brine because of the salt. Brining opens the cell walls of the chicken, allowing more water to enter and remain during cooking. This results is juicier chicken and more flavor. How Much Chicken Marinade Should I Use? In general, 1/2 cup of marinade is good for 1 pound of chicken. Often, chicken can get rather dry when grilling or baking. 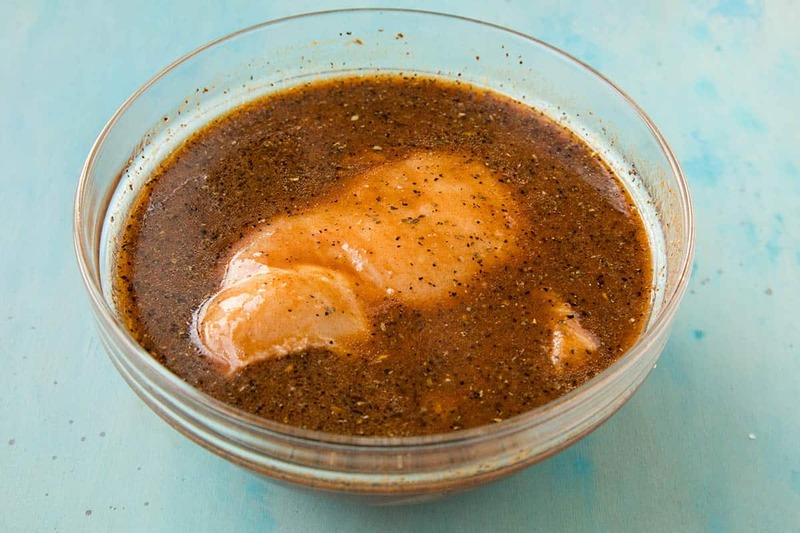 A good chicken marinade can make all the difference in terms of flavor and juiciness. Can I Use This Marinade on Other Meats? Of course! 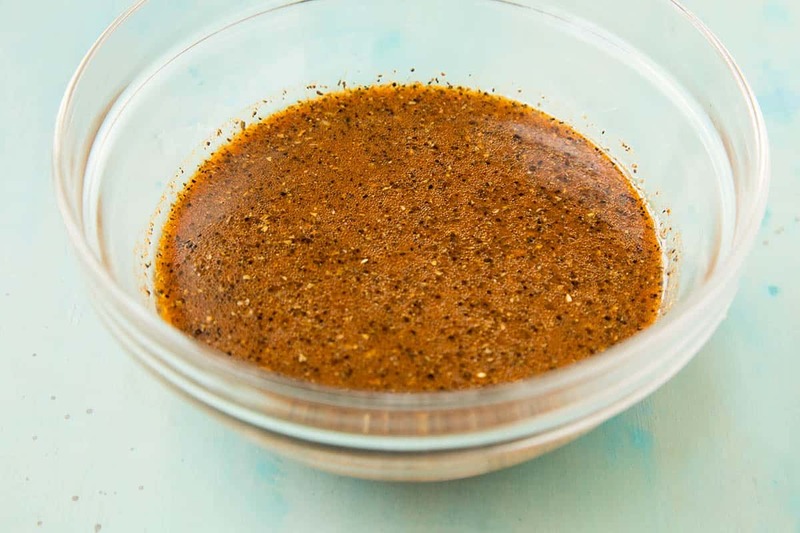 This spicy marinade also works great for pork, fish or shrimp. I enjoy it with bone-in pork chops, and also with salmon fillets. Marinating Chicken Overnight – is is Necessary? You will get the most flavor penetration if you marinade your chicken overnight. Be sure to keep it in the refrigerator, covered. A ziplock bag works great for this. However, if you simply do not have the to marinate your chicken for that long, you will still get very good flavor if you marinate for only 1 hour. 30 minutes can work if you chop up the chicken into very small pieces. Longer is better if you can afford the time. It really is an easy chicken marinade. I prefer 24 hours. If you enjoy this recipe, I hope you’ll leave a comment with some STARS. Also, please share it on social media. Don’t forget to tag us at #ChiliPepperMadness. I’ll be sure to share! Thanks! 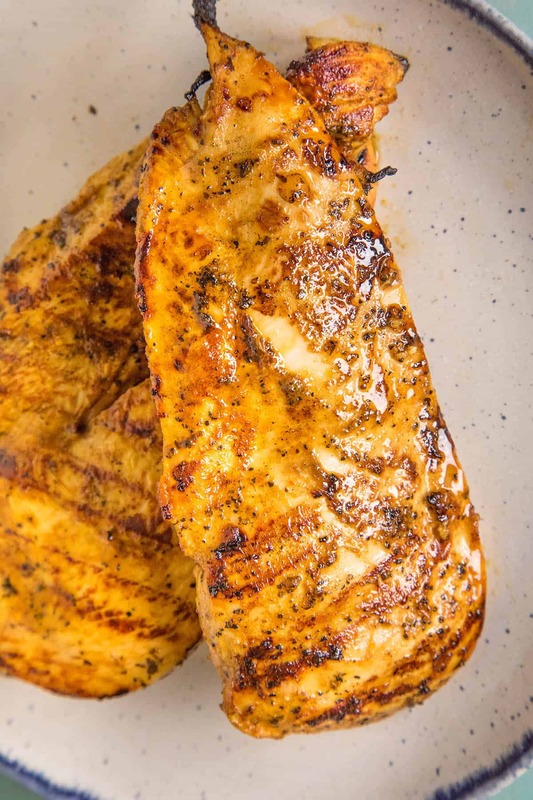 — Mike H.
This spicy bbq chicken marinade will give you the most tender and juicy chicken on the grill, and you can make it as spicy as you want it. Let the author of "The Spicy Food Lovers' Cookbook" show you how to spice it up! Whisk all of the ingredients together until well combined. Marinate your chicken in a baggie or large bowl, sealed, at least 8 hours in the refrigerator, or overnight for even more flavor. NOTES: Use 7-Pot or Reaper powder for even MORE heat! If you’d like a milder version, use cayenne powder, or for a low heat version, use paprika. Nutritional Information calculated without the chicken. Used this for bone on chicken thighs and baked in the oven on a raised edge baking sheet for 45 minutes at 180c fan oven. Excellent. Recipe saved as a favourite. Outstanding, Richard! Glad you enjoyed it! i appreciate the note. Hi Mike, Have been a fan for a long while and enjoyed many of your delish recipes. I noticed that your in northern ILL, grew up in Rockton ILL, just south of Beloit Wisc. Every time I was in Chi-town had to stop in this spice store just off michcigan ave and stock up on Walkers Woods Jamacain jerk seasoning had scotch bonnets and many other seasonings in it. Alas now live in Montana and the jerk here is like sweet n sour not good at all. Have you tried any jerk recipes? you would be a savior if you would post one as have been longing for that taste mmmmm. Hi, Jim! Yes, not far away at all. I do have some Jerk recipes on the site. Here are a few that might help. Let me know. — Jamaican Jerk-Peach Hot Sauce, Jerk Chicken Wings with a Homemade Jerk Sauce, Homemade Jerk Seasoning, Jamaican Jerk Chicken. I hope you can find some good jerk blends in Montana.